Cadmium (Cd) as a metalloesterogen may have a role in development of ovarian cancer. One of the critical target genes of estrogens is progesterone receptors (PRs). There are controversial studies on association between Cd, PRs, and cell proliferation. This study investigates the effect of Cd on proliferation of ovarian cancer cell lines, PRA and PRB expression and their relationship. OVCAR3 and SKOV3 cells were treated with CdCl2 (1-100 nM) and cell proliferation was assayed using bromodeoxyuridine (BrdU) method. The mechanism underlying the proliferative effect of Cd mediated by PRs was examined using cell transfection with PR- small interfering RNA (siRNA) and western blot analysis. Our results showed the involvement of PRs in Cd induced proliferation of ovarian cancer cells. Progesterone receptors are involved in proliferative effect of Cd. Moreover, Cd modified the expression of PRA and PRB and induced ovarian cancer cell proliferation through the change of PRA/PRB ratio. In conclusion, there is a mechanistic association between Cd effects on ovarian cancer cell proliferation, estrogen receptors and PRs expression. Over recent years, many environmental compounds have been known to mimic the physiological estrogens activity such as xenoesterogens, phytoesterogens, and metalloesterogens . Cadmium (Cd), a prevalent environmental contaminant, is determined as a potent metalloesterogen . Cd like estradiol induces cell proliferation, increases the transcription and expression of estrogen regulated genes and activates estrogen receptors (ER) ,. It has been reported that Cd has potential role in development of the hormone-dependent cancers . One of the critical target genes of estradiol is progesterone receptors (PRs). Estrogen-induced PRs expression, which is different in various tissues, is required for tissue proliferation and development . PRs are increasingly considered as important regulators of women cancers. It is remarkable that PRs were identified as good markers of estrogen and antiestrogen sensitivity in most human breast cancer patients . Some studies have shown that the expression of PRs is a favorable prognostic marker which associates with longer free survival in ovarian cancer patients , but others have not shown this benefit ,. Three PR isoforms are known consisting of PRA, PRB, and the non-functional PRC. PRB and PRA are typically expressed in equal number and act as ligand activated transcription factors . These two isoforms demonstrated different functional characteristics and transcriptional activation depends on cell and tissue types . Evidences derived from pathophysiology of ovarian cancer as the most lethal hormone-related cancer show a strong relationship with ER-induced PRs . Moreover, it was reported that Cd can change PRs expression in some hormone-related cancers such as breast and uterus cancer ,,. Until recently, there are controversial studies about association between Cd and stimulation of PRs and cell proliferation. The detailed mechanism of Cd in ovarian cancer is unknown. The current study was undertaken to evaluate the effect of Cd on the involvement of PRA and PRB involvement in ovarian cancer cell lines..
RPMI-1640 and other growth supplements were obtained from Gibco (Germany). CdCl2 and progesterone were purchased from Sigma-Aldrich Company (Munich, Germany). BrdU kit, RNX-Plus and c-DNA synthesis kit were provided from Roche (Canada), Sinaclon (RN7713C) and Takara Bio INC (Japan), respectively. Glyceraldehyde-3 phosphate dehydrogenase (GAPDH), human antibody (G-9: sc 365062), ICI 182,780, mouse monoclonal antibody of PR (AB-52): sc-810, gout anti-mouse IgG1-HRP (sc-2005), PR-small interfering RNA (siRNA) (sc 36309) and siRNA transfection reagent were purchased from Santa Cruz Biotechnology Company (Japan). Human epithelial ovarian cancer cell lines, OVCAR3 and SKOV3, expressing ERs and PRs were purchased from Pasture Institute of Iran (Tehran, I.R. Iran). These cell lines have been frequently used in the most similar studies because epithelial ovarian cancer is the most common type of ovarian cancer. Experiments were performed in RPMI-1640 supplemented with 5% charcoal treated 1% FBS, 100 units/mL penicillin G and 100 μg/mL streptomycin incubated in 95% air and 5% CO2 at 37 °C. Bromodeoxyuridine (BrdU) kit was used for cell proliferation assay according to the manufacturer's protocol. 24 h after cell culturing in 96-well plates, the cells were exposed to CdCl2 (1-100 nM) and progesterone (100 μM) for 48 h. Then the cells were labeled by BrdU solution. In addition, the cells were denatured by kit's FixDenta solution and were then incubated with peroxidase-conjugated anti-BrdU antibody. The substrate of peroxidase was added to the cells and the color reaction was developed for 5 min. Finally, the reaction was stopped by addition of 25 μL of sulfuric acid (1 M) and optical density of the samples was determined at 370 nm. The cells were cultured in 6-well plates and transfected with PR-siRNA (40 nM) using a transfection reagent and incubated for 7 h. After that, without removing the transfection mixture, the cells were incubated with the medium containing 2 × FBS for 24 h. Then the transfection mixtures were replaced with 10% FBS fresh medium and incubated for 24 h. Finally, cells were harvested 24 h after CdCl2 and progesterone treatment and applied for BrdU and western blotting analysis. Western blotting method was used to assay the expression of PRA and PRB. After treatment of cells with CdCl2 (1-100 nM) and progesterone (1 μM) for 24 h, cell protein content was extracted by RIPA lysis buffer. Equal amount of protein of each sample was separated by sodium dodecyl sulfate (SDS) gel electrophoresis and transferred onto polyvinylidene difluoride (PVDF) membranes of Amersham Pharmacia Biotech (United Kingdom) and incubated overnight with mouse monoclonal antibody as primary antibody against PRA and PRB at 4 °C. The gout anti-mouse IgG1-HRP was employed as secondary antibody for 2 h at room temperature. Bio-Rad ECL reagent (Canada) was utilized to detect protein expression. GAPDH was used as housekeeping gene in this study. Analysis of variance (ANOVA) followed by Dunnett's test and independent sample t-test used for analysis of the data by software SPSS18.0. The results were represented as means ± SD and P value < 0.05 was regarded as statistically significant. The cells were treated for 48 h with 1-100 nM CdCl2 in the presence of ICI 182,780 (10 μM) with pre-incubation for 1 h and without ICI 182,780 as an ER inhibitor to verify metalloestrogenic effect of Cd on the proliferation of ovarian cancer cell lines using BrdU assay. Maximum proliferative response of cells was observed at minimum concentration of CdCl2 (1 nM). Progesterone (100 nM) significantly decreased cell proliferation compared to control. Furthermore, ICI 182,780 significantly inhibited CdCl2-induced proliferation compared to corresponding Cd-treated cells without ICI 182,780 in OVCAR3 and SKOV3 cells (results are not shown). Since the expression of PR genes is estrogen-dependent and also we observed that Cd-induced ovarian cancer cell proliferation was mediated by ERs, we investigated whether PRs are involved in CdCl2-induced proliferation. Thus, PR-siRNA was used for knockdown of PR genes and cell proliferation was evaluated. Firstly, the inhibitory effect of siRNA on PRs expression of cells was assayed by western blotting method [Figure 1]A and [Figure 1]B. 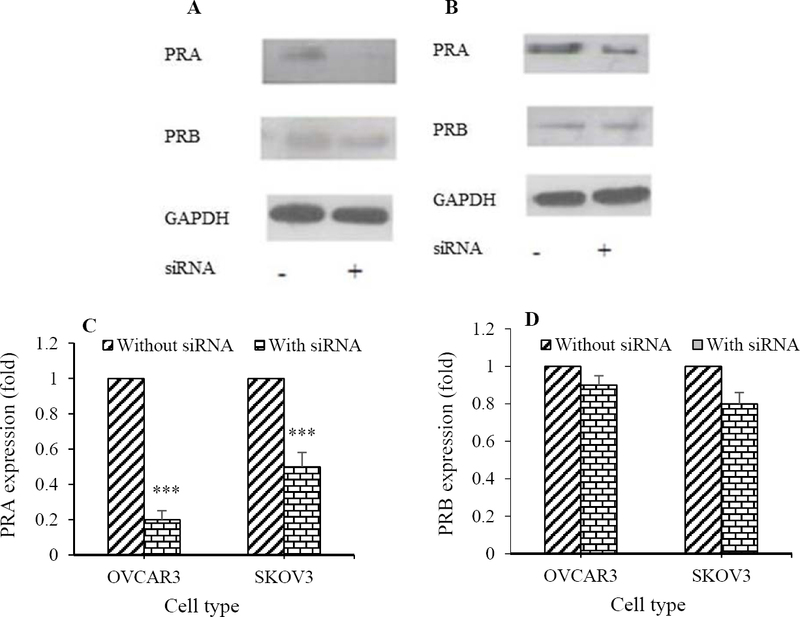 Although siRNA transfection significantly reduced the expression of PRA (OVCAR3: 5 fold and SKOV3: 2 fold; [Figure 1]C), PRB expression was not significantly inhibited [Figure 1]D. Furthermore, BrdU assay showed that PRA-siRNA significantly attenuated Cd-induced proliferation in OVCAR3 (44% for 1 nM, 28% for 10 nM, and 20% for 100 nM; [Figure 2]A) and SKOV3 cells (44% for 1 nM, 27% for 10 nM, and 16.5% for 100 nM; [Figure 2]B). Significant difference between progesterone-treated cells without PRA-siRNA and with PRA-siRNA was not observed. Inhibitory effect of PRA-siRNA on Cd-induced proliferation indicates that Cd induces proliferation of ovarian cancer cells through PRA. Figure 1: Small interfering RNA (siRNA) transfection inhibited the expression of progesterone receptor A (PRA) in ovarian cancer cell lines. PR-siRNA transfection was assayed by western blotting method in (A) OVCAR3 and (B) SKOV3 cells. Quantitative analysis of relative level of (C) PRA and (D) PRB expression was performed by image j software compared to Cd (0) (***P < 0.001). Figure 2: Small interfering RNA (siRNA) transfection of progesterone receptor (PR) significantly attenuated cadmium-induced proliferation of ovarian cancer cell lines. Proliferation of (A) OVCAR3 and (B) SKOV3 cells were assayed by bromodeoxyuridine after cell treatement with CdCl2 (100, 10, and 1 nM) and progesteron (100 nM). Asteriscks show significant differences between cells in the presence of siRNA transfection and without siRNA (*P < 0.05, **P < 0.01). P, Progesterone; CC, CdCl2. 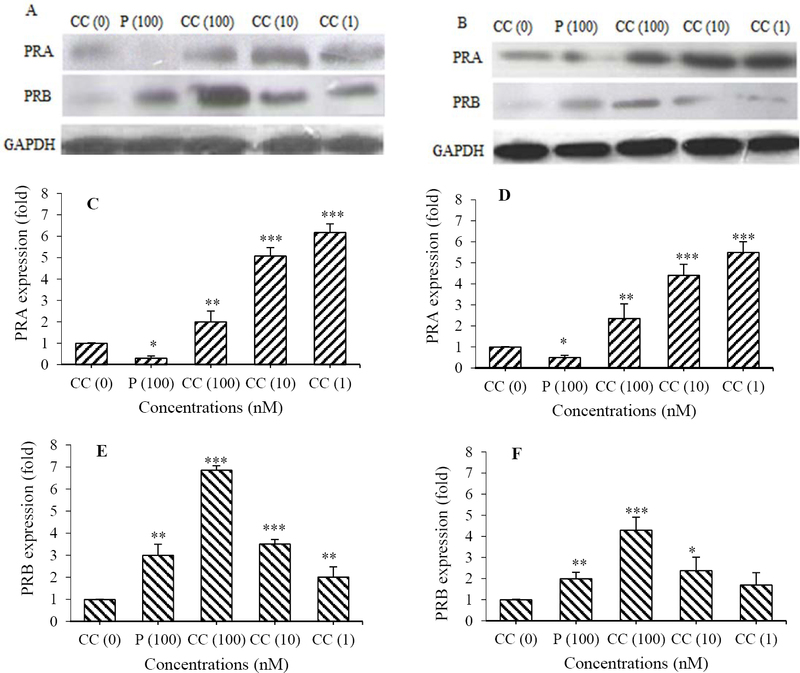 We evaluated the expression of PRA and PRB by western blot assay [Figure 3]A and [Figure 3]B after cell treatment with CdCl2 (1-100 nM) for 24 h. The results demonstrated that Cd differently changed the expression of PRA [Figure 3]C and [Figure 3]D and PRB [Figure 3]E and [Figure 3]F. Although CdCl2 dose-dependently increased PRB, PRA increased in a dose-dependent reverse manner. Maximum expression of PRB was seen at highest concentration of CdCl2 (100 nM) (6.8 ± 0.2 folds for OVCAR3 and 4.3 ± 0.6 for SKOV3, respectively), however, maximum expression of PRA was observed at lowest concentration of CdCl2 (1 nM) (6.2 ± 0.4 folds for OVCAR3 and 5.5 ± 0.5 for SKOV3) as well as proliferation. It suggests that PRA is directly and PRB is inversely related to CdCl2-induced proliferation. Interestingly, the effect of progesterone on expression of PRs is completely different from that of Cd. Progesterone (100 nM) decreased PRA but increased PRB expression in both ovarian cancer cell lines. Figure 3: CdCl2 induced the expression of progesterone receptor (PR) A and B. The cells were treated with CdCl2 (100, 10 and 1 nM) and progesteron (100 nM). The expression of PRA and PRB in (A) OVCAR3 and (B) SKOV3 cells were assayed using western blotting method. Quantitative analysis of the expression of PRA in (C) OVCAR3, (D) SKOV3 cells; PRB in (E) OVCAR3, (F) in SKOV3 cells were performed by image j software. Asterisks show significant differences compared to Cd(0), (*P < 0.05, **P < 0.01, and ***P < 0.001). P, Progesterone; CC, CdCl2. We also investigated whether the expression of PRs induced by Cd was dependent on ERs activation. OVCAR3 and SKOV3 cells were treated with CdCl2 (1-100 nM) for 24 h in the presence of ICI 182,780 (1 h pre-incubation) and without ICI 182,780. Then the expression of PRA [Figure 4]A and PRB [Figure 4]B were determined by western blot analysis using monoclonal antibody. ICI 182,780 significantly decreased the expression of PRA in OVCAR3 cells (25 folds for 100 nM, 2.85 folds for 10 nM, 1.4 folds for 1 nM of CdCl2, [Figure 4]C) and in SKOV3 cells (1.6 folds for 100 nM, 1 fold for 10 nM, 5 folds for 1 nM of CdCl2, [Figure 4]D). Furthermore, ICI 182,780 could inhibit the Cd-induced expression of PRB in OVCAR3 (1.5 folds for 100 nM, 2.5 folds for 10 nM, 3 folds for 1 nM of CdCl2, [Figure 4]E) and in SKOV3 cells (1.5 folds for 100 nM, 6.6 folds for 10 nM, 2.6 folds for 1 nM of CdCl2, [Figure 4]F). This suggests that Cd induced the expression of PRs in an ER-dependent mechanism. Figure 4: CdCl2 induced the expression of progesterone receptors (PR) in an ER-dependent manner. The expression of (A) PRA and (B) PRB in the presence of ICI 182,780 and without ICI 182,780 were assayed using western blotting method in CdCl2-treated cells. Quantitative analysis of the expression of PRA in (C) OVCAR3, (D), SKOV3 cells; PRB in (E) OVCAR3, and (F) in SKOV3 cells were performed by image j software. Asterisks show significant differences between CdCl2-treated cells in the presence of ICI 182,780 and corresponding cells without ICI 182,780 (*P < 0.05, **P < 0.01, and *** P < 0.001). CC, CdCl2; ICI, ICI 182,780. Recent studies suggest that Cd is a potent metalloesterogen that can induce cell proliferation similar to estradiol and increase transcription and expression of estrogen regulated genes such as PR ,. It has been demonstrated that there is a link between Cd exposure and estrogen-related cancers such as breast and uterine cancer . What has been missing is solid evidence that Cd has effect on ovarian cancer etiology. The results of the present study show that low concentrations of Cd promoted ovarian cancer cell proliferation in an ER-dependent mechanism and dose-response manner. Wei, et al. showed that Cd at low concentrations could increase breast cancer cell proliferation ,. It has been explored that Cd promoted cell proliferation in a dose-dependent reverse manner in breast cancer cell lines ,. Moreover, PRs are important estrogen-regulated genes. PRs have been suggested as indicators of estrogen responsiveness in some hormone-dependent malignancies . PRs have also considered as favorable predictive and prognostic markers in ovarian cancer ,. These findings suggest that PRs involve in development of ovarian malignancy. Differential patterns of the expression of PR isoforms have special importance in ovarian carcinogenesis . Our results demonstrated that PRA-siRNA transfection inhibited cell proliferation of CdCl2-treated cells. It was indicated that PRA played a key role in Cd-induced proliferation of these cell lines. Bellance, et al. demonstrated that regulatory effect of progesterone would be mediated mainly by PRB, however, PRA could regulate some cell processes without progesterone ligand or by other ligands in some cells. They showed that PRA activation stimulated the cells to exhibit aggressive phenotype . No study has been performed to show which isoform of PRs have possible role in proliferative effect of Cd. Based on our observation, CdCl2 in an ER manner increased the expression of both PRA and PRB but conversely. Maximum expression of PRA, highest proliferation of cell lines and lowest expression of PRB was observed at lowest concentration of CdCl2 (1 nM). It is possible that low concentration of CdCl2 increased cell proliferation by induction of PRA and at higher concentration of CdCl2 (100 nM) with lower proliferation, PRA expression decreased. Unlike Cd, progesterone as a biological agonist of PRs induced the expression of PRB in ovarian cancer cell lines. Jacobsen, et al. explained that PRA and PRB are equimolar in the normal tissues but in advanced cancers, their expression would be deregulated. They demonstrated that expression of PRA was increased in breast tumors and excessive PRA are linked with breast cancer risk . Johnson, et al. reported that in the uterus and mammary gland of rodents accompanied by cell proliferation, Cd induced PRs as an ER-regulated gene . Brama, et al. showed that CdCl2 (10 μM) significantly increased PR expression and altered breast cancer cell line homeostasis . Although these studies evaluated Cd effect on PR, none of them specified receptor subtypes. PR subtypes have various transcriptional activities in different tissues. For instance, PRA is necessary for uterine maturation, while PRB is needed for mammary gland growth . Diep, et al. reported that PRB expression in ovarian tumors are associated with tumor growth diminution and longer free survival of patients . Some researchers have claimed that change in PRA/PRB ratio is a key determinant factor that directly has influence on hormone-related cancers ,. This study was financially supported (Grant No. 394160) by the Vice Chancellery of the Isfahan University of Medical Sciences, Isfahan, I.R. Iran. Byrne C, Divekar SD, Storchan GB, Parodi DA, Martin MB. Cadmium--a metallohormone? Toxicol Appl Pharmacol. 2009;238(3):266-271. Brama M, Gnessi L, Basciani S, Cerulli N, Politi L, Spera G, et al. Cadmium induces mitogenic signaling in breast cancer cell by an ERα-dependent mechanism. Mol Cell Endocrinol. 2007; 264(1-2):102-108. Martínez-Campa C, Alonso-González C, Mediavilla MD, Cos S, González A, Ramos S, et al. Melatonin inhibits both ER alpha activation and breast cancer cell proliferation induced by a metalloestrogen, cadmium. J Pineal Res. 2006;40(4):291-296. Brisken C. Progesterone signalling in breast cancer: a neglected hormone coming into the limelight. Nat Rev Cancer. 2013;13(6):385-396. Diep CH, Daniel AR, Mauro LJ, Knutson TP, Lange CA. Progesterone action in breast, uterine, and ovarian cancers. J Mol Endocrinol. 2015;54(2): 31–53. Lee P, Rosen DG, Zhu C, Silva EG, Liu J. Expression of progesterone receptor is a favorable prognostic marker in ovarian cancer. Gynecol Oncol. 2005;96(3):671-677. Chen S, Dai X, Gao Y, Shen F, Ding J, Chen Q. The positivity of estrogen receptor and progesterone receptor may not be associated with metastasis and recurrence in epithelial ovarian cancer. Sci Rep. 2017;7(1):16922-16928. Lancaster JM, Wenham RM, Halabi S, Calingaert B, Marks JR, Moorman PG, et al. No relationship between ovarian cancer risk and progesterone receptor gene polymorphism in a population-based, case-control study in North Carolina. Cancer Epidemiol Biomark Prev. 2003;12(3):226-227. Luo H, Li S, Zhao M, Sheng B, Zhu H, Zhu X. Prognostic value of progesterone receptor expression in ovarian cancer: a meta-analysis. Oncotarget. 2017;8(22):36845-36856. Bellance C, Khan JA, Meduri G, Guiochon-Mantel A, Lombès M, Loosfelt H. Progesterone receptor isoforms PRA and PRB differentially contribute to breast cancer cell migration through interaction with focal adhesion kinase complexes. Mol Biol Cell. 2013;24(9):1363-1374. Johnson MD, Kenney N, Stoica A, Hilakivi-Clarke L, Singh B, Chepko G, et al. Cadmium mimics the in vivo effects of estrogen in the uterus and mammary gland. Nat Med. 2003;9(8):1081-1084. Wei Z, Song X, Shaikh ZA. Cadmium promotes the proliferation of triple-negative breast cancer cells through EGFR-mediated cell cycle regulation. Toxicol Appl Pharmacol. 2015;289(1):98-108. Jiang G, Duan W, Xu L, Song S, Zhu C, Wu L. Biphasic effect of cadmium on cell proliferation in human embryo lung fibroblast cells and its molecular mechanism. Toxicol In Vitro. 2009;23(6):973-978. Ataei N, Aghaei M, Panjehpour M. The protective role of melatonin in cadmium-induced proliferation of ovarian cancer cells. Res Pharm Sci. 2018;13(2):159-167. Khojastehfar A, Aghaei M, Gharagozloo M, Panjehpour M. Cadmium induces reactive oxygen species-dependent apoptosis in MCF-7 human breast cancer cell line. Toxicol Mech Methods. 2015;25(1):48-55. Jacobsen BM, Schittone SA, Richer JK, Horwitz KB. Progesterone-independent effects of human progesterone receptors (PRs) in estrogen receptor-positive breast cancer: PR isoform-specific gene regulation and tumor biology. Mol Endocrinol. 2005;19(3):574-587. Lange CA. Integration of progesterone receptor action with rapid signaling events in breast cancer models. J Steroid Biochem Mol Biol. 2008;108(3-5):203-212. 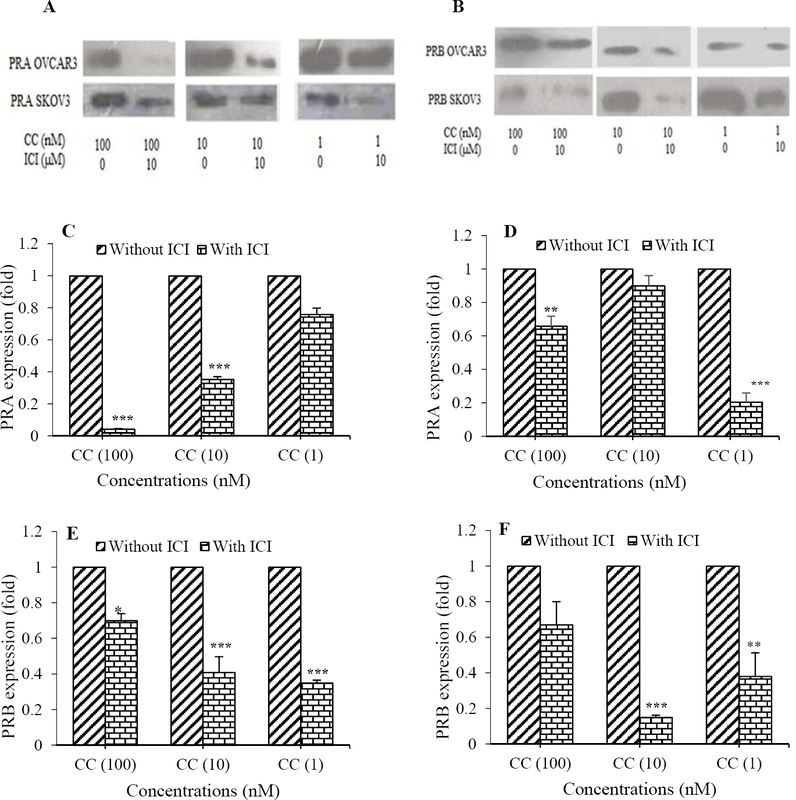 Khan JA, Bellance C, Guiochon-Mantel A, Lombès M, Loosfelt H. Differential regulation of breast cancer-associated genes by progesterone receptor isoforms PRA and PRB in a new bi-inducible breast cancer cell line. PLoS One. 2012;7(9):e45993. Jacobsen BM, Horwitz KB. Progesterone receptors, their isoforms and progesterone regulated transcription. Mol Cell Endocrinol. 2012;357 (1-2):18-29.